Tomas is much weaker this morning. Even as untrained eye can see the disrupted pattern displayed on the satellite imagery. We do not believe that Tomas is close to hurricane strength. A strong upper trough associated with a strong cold front is shearing Tomas. It is not longer a threat to land and continues to weaken. This will be the last update on Tomas. 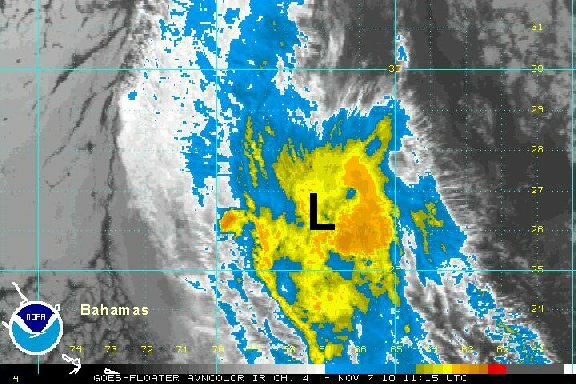 As of 7 am est / 8 am ast Tomas was centered near 26.3° N / 67.7° W or about 455 miles south southwest of Bermuda. Top sustained winds are estimated at 55 mph (NHC 75 mph estimate - 5 am ast advisory). Movement - east northeast 12 mph. Pressure estimated at 989 mb.